S Saraswathi says director Vikram Sukumaran’s Madha Yaanai Koottam reveals in great detail the rites and rituals followed after death and how pride, anger and vengeance can only lead to senseless violence and death. Popular music director G V Prakash Kumar's maiden production, Madha Yaanai Koottam, is directed by Vikram Sukumaran, former assistant of the legendary Balu Mahendra. JSK Film Corporation has acquired the distribution rights of the film. The film features newcomer Kathir and Oviya in the lead roles supported by Viji Chandrasekhar, Vela Ramamoorthy, P Gopalakrishnan and others. Madha Yaanai Koottam, when translated means ‘Group of mad elephants’. The characters of the film do exactly what a herd of mad elephants would do, go on a senseless rampage destroying everything in sight for no apparent reason. The film opens with a death scene and every 15 minutes there is another death. Jayakodi Thevar is unfortunately the man whose death is being celebrated in a grand manner with loud music, dancing, fire crackers, and a continuous supply of drinks and food. As a eulogy, the artists sing about the greatness of the dead man and the film shifts into a flashback. Jayakodi Thevar has two wives and is currently staying with his second wife and their son Paarthi (Kathir) and daughter. The older wife also has a son and daughter, but is living under the protection of her brother. She wants nothing to do with her husband as she feels he has betrayed her. The enmity between the older wife’s brothers and his children and Paarthi is the crux of the story. The minute the former hear about Jayakodi’s death, they carry his body out of Paarthi’s house stating that only the older wife has rights to the body. They don’t allow Paarthi, his mother or sister to join in the rituals. Paarthi, who initially remains passive, is forced by circumstances to join in this stupid, mindless fight, where there is absolutely no regard for life. The first half of the film reveals the various rituals followed after death, in great detail. We also get to know about an interesting custom called seimurai, where the relatives have to buy new clothes and even gold jewellery for the surviving members of the family. The second half is the usual revenge saga, which is totally unimaginative and boring. Oviya plays Kathir’s love interest and has absolutely nothing to do in the film. Kathir seems to walk around like Vishal and though he does have the height and built to carry off the role, his face looks too innocent and guileless to express the intense hatred and anger. All the other characters, however, have been chosen well: menacing lungi-clad tough guys, with the ever present aruva in their hands and of course the authentic dialect of Theni. The songs and background score by N R Raghunanthan and cinematography by Ragul Dharuman, who has skilfully captured the mood and setting of the film is definitely a plus. 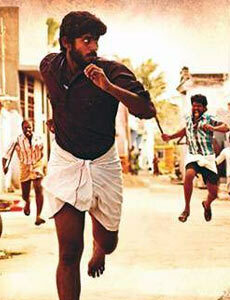 Director Vikram Sukumaran’s Madha Yaanai Koottam deals with many emotions: hatred, vengeance, betrayal, fear. But pride and anger seems to take precedence and the film eventually ends in a mad rampage of revenge, brutally slaughtering everything in sight.